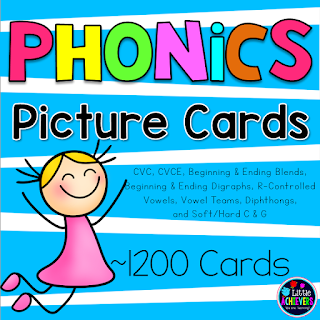 A BIG BUNDLE of phonics picture cards for pocket chart center or activities!! This packet includes 1200 phonics flip cards. Each card displaying a word and a picture to go with it. I’ve also included headers (within each file) and black letter tiles (in two font sizes) with the red-color option for vowels. The possibilities for these cards are endless. These can be used to introduce phonics words to larger groups, smaller groups, during RTI time, one-on-one instructions, as a literacy center activity, for review, or as a free-time activity to keep your students engaged. Click HERE to view the packet! 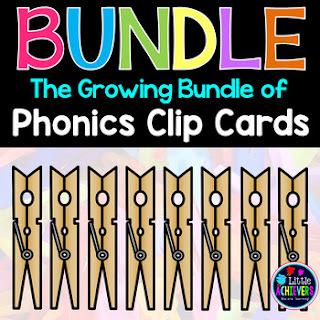 Sounds included: CVC, CVCE, Beginning and Ending Digraphs, Beginning and Ending Blends, Diphthongs, Vowel Teams, R-Controlled Vowels, Hard and Soft C, Hard and Soft G.
These cards go well with my Phonics Clip Cards BUNDLE. Please click here to view the bundle.